It’s not often that I set an alarm to 3am willingly. This time, I did. And I was actually excited when it went off. 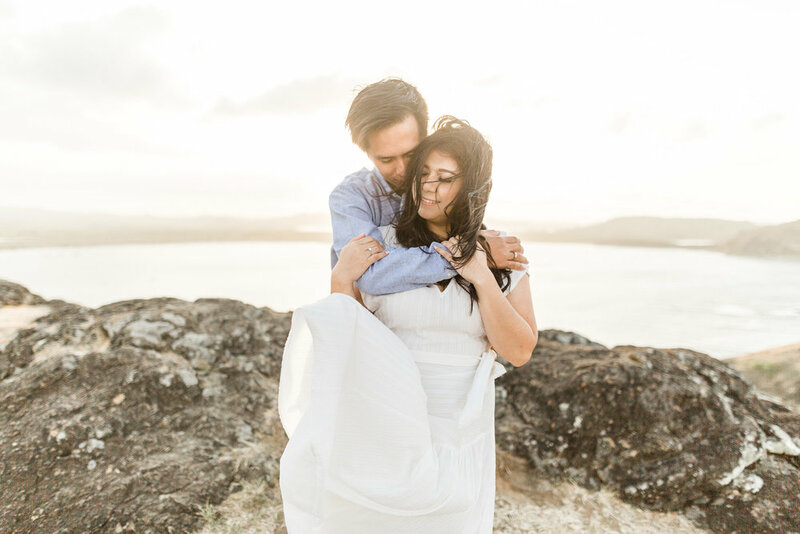 The reason was the shoot we had planned for that day: After their wedding, Rani and Chris decided to also to a pre-wedding-shoot on Lombok with me. We had driven down to the south the previous day to be ready to start shooting at sunrise. Thankfully, local photographer and our guide Alfian knew the surroundings well and suggested a few spots to shoot at beforehand. We decided to go up to Bukit Merese for the sunrise shoot and then hit two more locations during the day. The ride through the darkness to Merese Hills was bumpy and long. We brought ramen cups to eat in the car as breakfast and stayed mostly silet. It was the middle of the night, after all. Together with make-up-artist Meliya we hiked up in total darkness, the path before us only illuminated by our cellphones. It was a truly special experience, especially since I had never been there so I absolutely did not know what I could expect from that location. It was extremely windy and we could hardly hear each other without shouting. When we arrived at the peak some outlines of the shore were visible down below and I decided on a spot to start our shoot during blue hour. We took a few shots and Rani and Chris were absolute naturals. It wasn’t their first shoot so they had had some experience but people normally still get nervous during a shoot. These two just fully enjoyed each others presence and seemed totally immersed in the moment. When the sun started rising, the view before me was absolutely phenomenal. I couldn’t stop shooting because I wanted to catch the first sunrays but later took the view in and had to stop and watch for a minute. Our world is a beautiful place and right there in that location it proved it to me again. After we had taken quite a few pictures on the hill we decided to drive over to our second stop, the so-called “Kryptonite beach”. The black stone formations truly look otherwordly and are such a stark contrast to the soft beauty of Merese Hills. But while driving to that location I spotted a place that I thought might be a good spot for some different images. As a photographer I’m always on the lookout for interesting spots and that was definitely one of them. We didn’t exactly know what that location was but we dubbed it “Mars” because of its red sandstone like texture and the feeling of being on another planet. There were no other people around and both Rani and Chris said they’d never noticed this before. 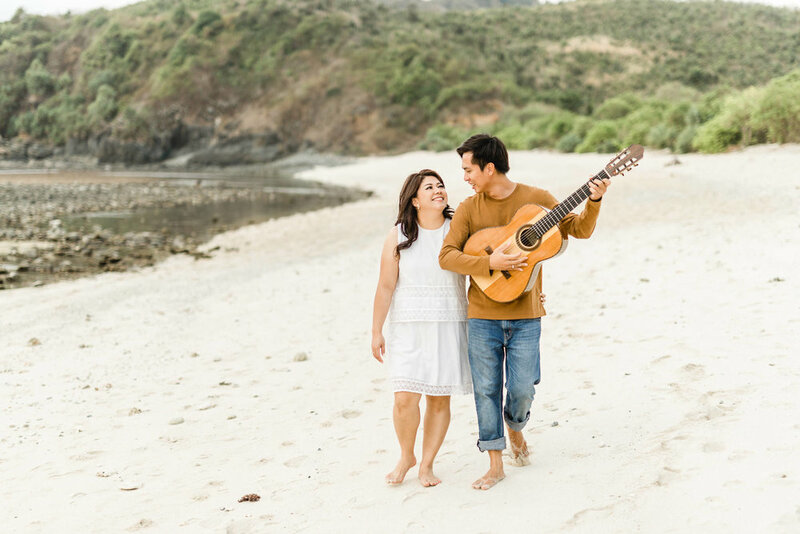 They were also happy to go along with my idea because, for one, it meant getting pictures nobody else had (Bukit Merese and Kryptonite beach are both very popular for shoots). That shoot took a bit of time so after scrambling around on some rock and me lying in te dirt and getting my dress all read we stopped for some lunch (I honestly had Shakshouka for the first time. In Lombok) before continuing on to our hotel to get changed and then to Kryptonite beach. I’m glad we made it back to the car in one piece - boy, those rocks are slippery! We ended the day at a sand beach where I had Chris get out his guitar and serenade his wife. It was a perfect day and I want to take this moment to thank not only Rani and Chris, but also Alfian and Meliya for their wonderful work!